Who would have thought that such a shoddy Sunday game show would achieve such a cult following? This Bullseye online quiz game is similar to the one you’ll find in the pub quiz machine next to the fruities. 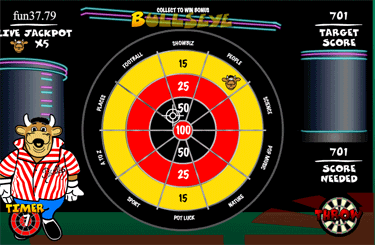 The format of the Bullseye online game is quite different to that of the TV show, but it has to be to keep the game playable. The combined aiming skills needed for the dart throwing and the witty-funny questions make this one of the very best online quiz games. The fact that it’s modeled on such a classic TV show gives it that extra nostalgic edge. The payouts are relatively low, but the maximum win is enough for an extra round or two on the weekend. It’s not as valuable as a speedboat, but infinitely more useful. What else would you expect from a game like Bullseye anyway? Bullseye fun rating - 86%. 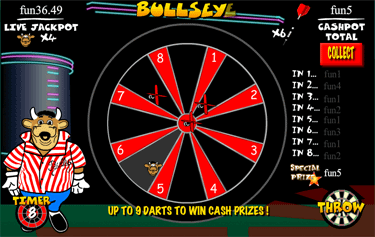 The Bullseye quiz game online combines both dart throwing clicking skills with questions, which is much more enjoyable than a constant barrage of questions that you have very little control over in some other quiz games. Fact: The opening sequence for this game looks like it’s been taken from a VHS recording. Classic. The main reason why Bullseye is one of the highest rated online quiz games is because it doesn’t get old or repetitive too quickly. Maybe it’s the unique game structure, maybe it’s because Jim Bowen is timeless, I don’t know. Either way, Bullseye is one of those games that you won’t just want to play once. 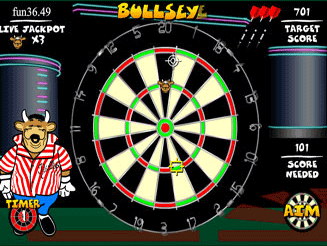 How to play Bullseye online. The basics of the Bullseye game. Throw the dart and try and score as many points as possible. Try and answer the questions correctly (obviously). Get to the infamous prize board round after the first two rounds. Generally speaking, score as many points as you can then answer the questions and you won’t go too far wrong. Bullseye online in more detail. You start the game with either 701 or 501 points and you have 3 lifelines to help you throughout the questions in the game. Try Again - If you answer incorrectly you get another chance. After this has been used up you must answer each question correctly first time from then onwards, else you lose the game. Reveal Answer - Reveals the answer for you. This counts as a correct answer and you move on. Pass - The question is swapped for another. You have to answer the new question to continue. Fact: Bullseye is one of the few games where you have to play with a fixed stake. The first round - general questions and points. The questions usually start off hilariously easy, then rapidly increase in difficulty before you know what’s hit you. After about 6 or 7 throws you should have enough points to move on to the next round. The second round - dart board round. Now it’s time to play with a more life-like dartboard. After the first round you should be left with around 100 points or so, which you have to try and clear on this real dartboard. If you fail to do so in 3 darts, you have to answer a question before trying again. If you manage to clear all of your points (don’t forget to finish on a double) you will move on to the next round. The third round - prize board round. This is where the money-making takes place. Here you have the black and red dartboard and you have 9 darts with which to win as much money as possible. If you land your dart in the red you win a prize (which adds up with every red section you hit). If you land in a black bed you do not win anything and you have to answer a question to continue. It takes some skill and timing to hit the red areas instead of the black ones, but if you make it to this round you should expect to win some money. 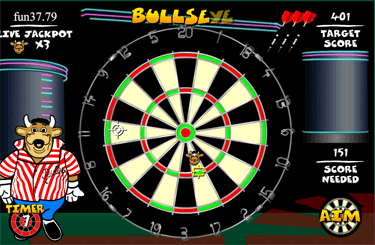 Throughout the game, Bully’s face will randomly appear on areas of the dartboard. If you manage to hit his face enough times you will release the Bullseye jackpot bonus. The number of Bullys you need to hit is indicated in the game window. It’s a bit of a calculated risk though, as most of the time Bully’s face will appear on sections of the dartboard that will not earn you many points, so it’s up to you whether you go for it or not. However, once you’ve won the Bullseye rolling jackpot you cannot lose it, and you can continue to play on in the game to win further prizes. Tip: It’s a good idea to go for the Bullseye game jackpot as it’s usually worth more than what you can win from the final prize board alone.